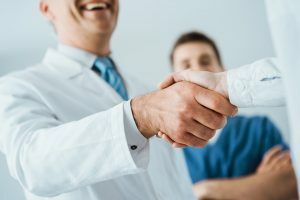 Orthopaedic Associates of St. Augustine is an integral part of the medical community in Northeast Florida and it is our commitment to offer the most comprehensive orthopaedic patient care in the area. Our team of doctors and medical professionals are some of the best in the industry. At OASA we are seeking skilled and energetic individuals who are always looking to challenge their abilities and grow. We offer the opportunity to be a part of a talented team of individuals who share the common goal of unsurpassed excellence in patient care. At OASA we value our employees and strive to meet all of our obligations to them by providing an excellent compensation and benefits package. We also practice a policy of promoting from within the company whenever possible, to ensure opportunities for upward career growth. If you are looking for an exciting opportunity and a team that feels more like family than co-workers, then OASA is the place for you! To apply for an open position, please email your résumé and cover letter to humanresources@oastaug.com or fax at 904.209.1035. Please no phone calls. Job Description: Answers incoming phone calls, direct calls to appropriate individuals, takes phone messages, and assists patients with scheduling, canceling or rescheduling of appointments. Minimum eighteen months experience working in a physician group practice/billing department.